In recent years a number of governments around the world have introduced assurance mechanisms for research, designed to increase the research productivity of higher education institutions. Such mechanisms have put pressure on accounting academics and schools to increase and improve their research output. These challenges co-exist with an international demand for accounting graduates leading to increased teaching loads. These developments make it timely to investigate the factors that affect the research productivity of accounting academics. 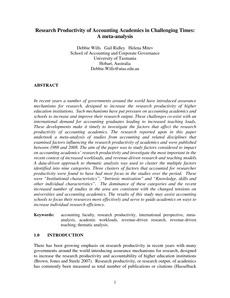 The research reported upon in this paper undertook a meta-analysis of studies from accounting and related disciplines that examined factors influencing the research productivity of academics and were published between 1988 and 2008. The aim of the paper was to study factors considered to impact on accounting academics’ research productivity and investigate the most important in the recent context of increased workloads, and revenue-driven research and teaching models. A data-driven approach to thematic analysis was used to cluster the multiple factors identified into nine categories. Three clusters of factors that accounted for researcher productivity were found to have had most focus in the studies over the period. These were "Institutional characteristics", "Intrinsic motivation" and "Knowledge, skills and other individual characteristics". The dominance of these categories and the recent increased number of studies in the area are consistent with the changed tensions on universities and accounting academics. The results of this study may assist accounting schools to focus their resources more effectively and serve to guide academics on ways to increase individual research efficiency. accounting faculty, research productivity, international perspective, metaanalysis,academic workloads, revenue-driven research, revenue-driven teaching, thematic analysis.